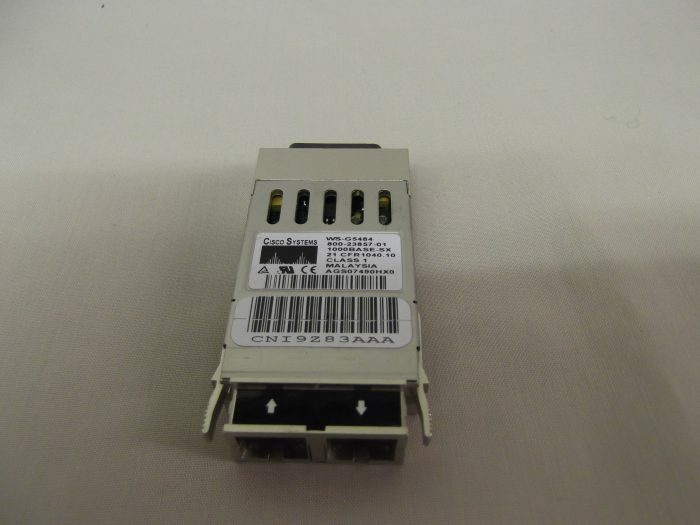 Cisco’s industry-standard Gigabit Interface Converter (GBIC) is a hot-swappable input/output device that plugs into a Gigabit Ethernet port/slot, linking the port with the fiber-optic network. GBICs can be used and interchanged on a wide variety of Cisco products and can be intermixed in combinations of IEEE 802.3z- compliant 1000BaseSX, 1000BaseLX/LH, or 1000BaseZX interfaces on a port-by-port basis. Furthermore, Cisco is offering a 1000BaseLX/LH interface that is fully compliant with the IEEE 802.3z 1000BaseLX standard, but has the ability to go up to 10 km over single-mode fiber, 5 km further than garden-variety 1000BaseLX interfaces. As additional capabilities are developed, these modules make it easy to upgrade to the latest interface technology, maximizing investment protection. The WS-G5484, 1000BaseSX operates on ordinary multi-mode fiber optic link spans of up to 550 m in length.